Richard Glücks was born on April 22, 1889 (two days after Adolf Hitler) in the city of Odenkirchen. After graduating from high school (gymnasium), he worked at his father’s fire insurance agency. In 1909, Glücks joined the army and served in the artillery for a year. In 1913, he lived in England and later moved to Argentina as a businessman. After World War I erupted, Glücks returned to Germany and joined the army, during which time he won the Iron Cross First and Second Class. After the war, Richard Glücks served in the Freikorps. Glücks joined the Nazi Party in 1930 and the SS in 1932. 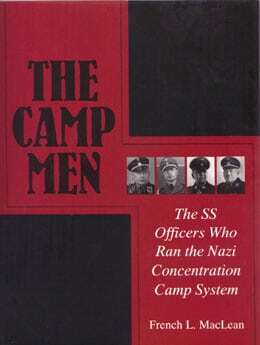 On April 1, 1936, he became the chief of staff for Theodor Eicke, then Concentration Camps Inspector. 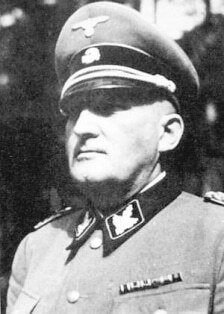 When Theodor Eicke joined SS Division “Totenkopf“, Glücks was elevated to Concentration Camps Inspector and on November 18, 1939, Heinrich Himmler named him as Eicke’s successor. On April 20, 1941, Himmler promoted Glücks to the grade of SS-Brigadeführer and on March 29, 1942, he assumed the position of the head of Amt D: Konzentrationslagerwesen of the SS-Wirtschafts-Verwaltungshauptamt (WVHA), the Economics and Administrative Department of the SS. He was promoted on July 23, 1943 to SS-Gruppenführer and a Generalleutnant of the Waffen-SS. By the end of the war, the WVHA headquarters transferred from Berlin to Born in Pomerania. Richard Glücks and his wife are believed to have fled the advancing Allies to Flensburg at the end of April 1945. Some sources believe that he took poison and committed suicide at the Mürwik Kriegsmarine base at Flensburg-Mürwik, but the chaos, lack of official records and the absence of a set of identifiable remains has led to speculation that he may have escaped justice and fled to Argentina and safety.